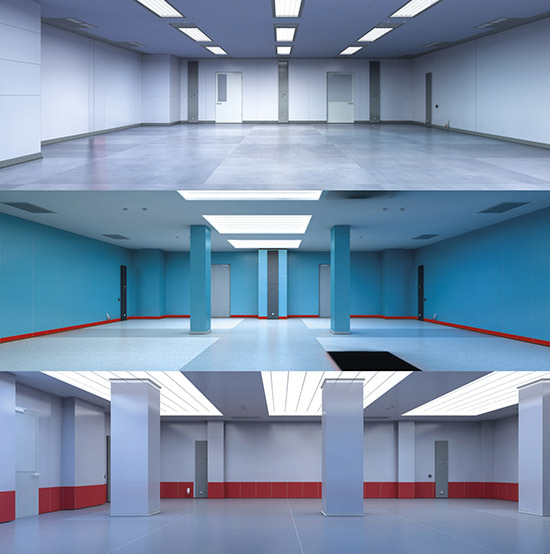 This product DOSCH 3D: Environments - Clean Room contains 5 detailed 3D-models/3D-scenes of clean rooms. The completely textured 3D-models are provided in multiple file formats: 3DS, 3dsmax (version 9 and above), 3dsmax V9 & VRay, 3dsmax V9 & Mental Ray, Lightwave (version 6 and above), FBX, Universal 3D, OBJ, Artlantis, Modo, VRML, Collada, SoftimageXSI, Cinema 4D version 13 and above, DWG, Maya and DXF, Blender, Cinema 4D + vRay..
5 detailed and completely textured city scenes. 3D-models for the visualization of TV-studios. 3d-scenes for the visualization of vehicles. 3D-model of a metro station with all important details. 20 surrounding scenes for product and vehicle visualization. 50 easy-to-use 3D-models of landscapes (mountains, plains, desert, snow-covered peaks). 5 detailed 3D-scenes of lofts. 5 detailed 3D-scenes of shops. 3D-models for a data center or server room. 3d-scenes for the visualization of cars and other vehicles. 3D-model of a train station with all important details. 5 detailed 3D-scenes of factory building interiors. Detailed 3d-model with all critical parts and systems found in an autonomous driving car. 100 detailed 3d-models of important car parts: batteries, brake-pads & disks etc. 100 3D-models of typical kitchen equipment. 3D-models of people in the T-pose. 30 rigged 3D-models of human charcters for the direct use in Cinema4D. 40 detailed 3d-models of fireplaces and accessories. 3D-models of complementary bathroom objects. The bundle contains 50 Dosch 3D products for professional visualizations. 100 3D-models of toys and playground equipment. Detailed 3d-model with all critical parts and systems found in an electric driving car.